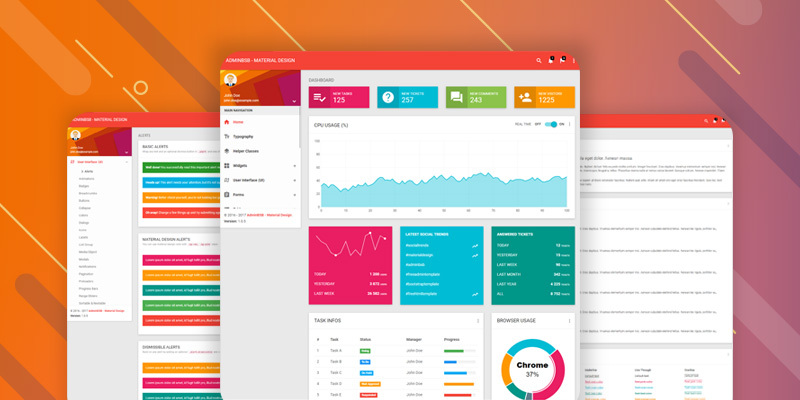 AdminBSB is a materialize admin template. 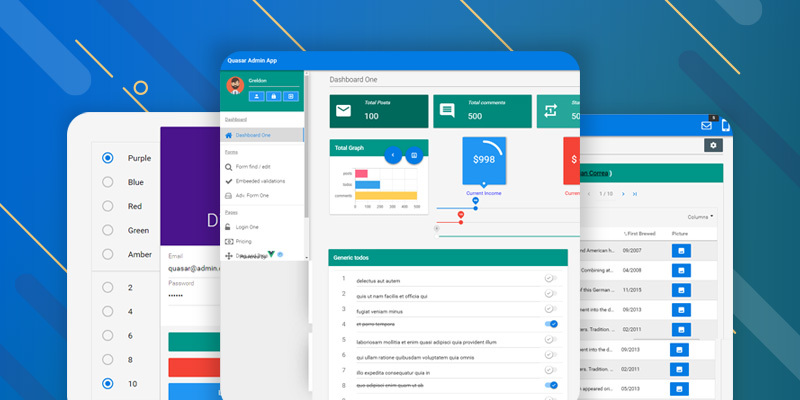 It Developed with Bootstrap 3.x and Google Material Design. 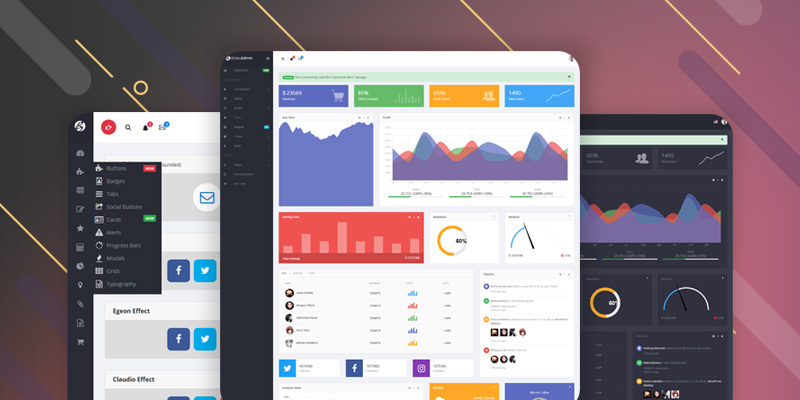 It used most common jQuery plugins which are compatible with Bootstrap 3.x. All files are arranged nicely and easy to edit. Adapt perfectly from 320px to large resolution devices. Everything is done , all you have to do just arrange the components and elements. Widgets: Cards and Infobox are added in the widget section. There is some variation for each widget. There are basic, colored and No header version for cards. On the other side, infobox has 5 variations. 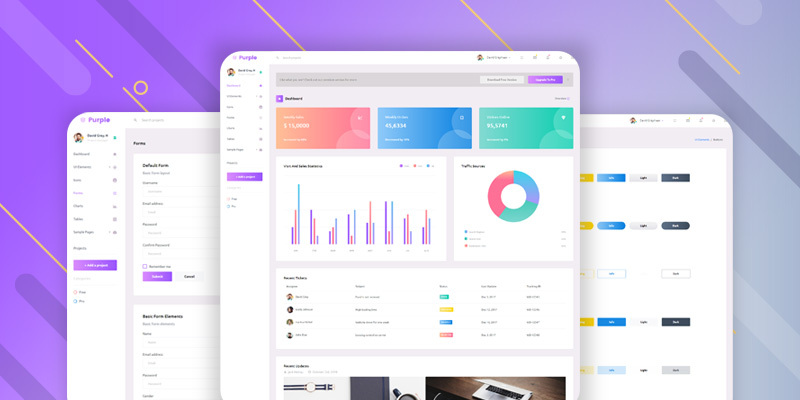 User Interface (UI): Within UI packed it has everything you need to Develop a modern Dashboard Template. 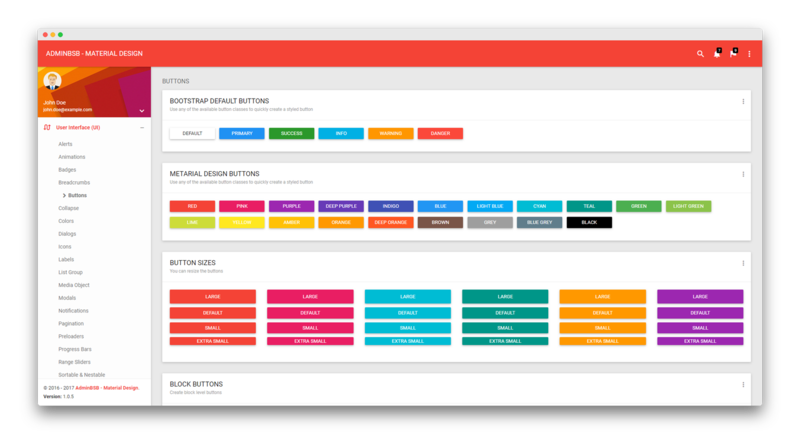 There are alert, Animation, Badges, Labels, Icons, etc. Most of all components have multiple variations, feel free to use the suitable one for you. Forms: All you need to arrange basic to advance form, everything is packed here. Different input type, Color checkbox, Radio button, Switch Button, DateTime picker, File uploading, Masked Input, Multi-column etc. Tables: Three type of tables are here. 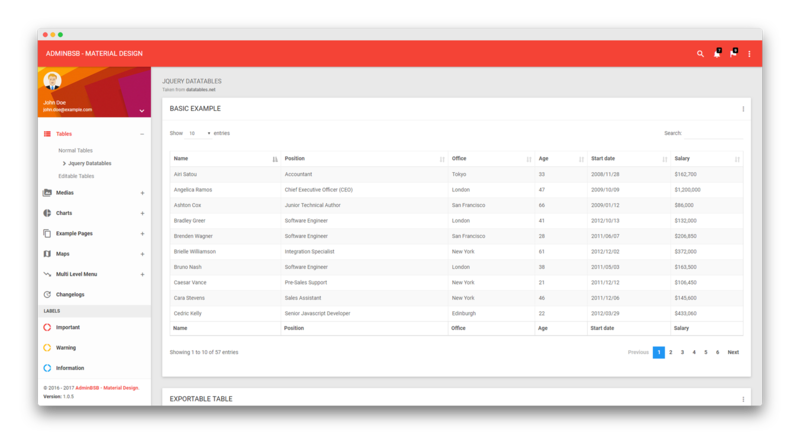 Normal Tables, jQuery Datatables and Editable Tables. Within Normal Table, you will see color tables too. jQuery Datatables allow you to customize how many table entries you want to see and easy navigate system. Editable tables allow writing or modify text. 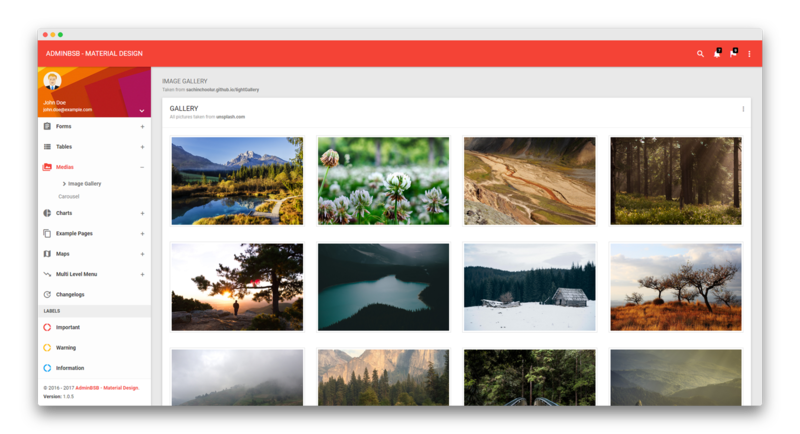 Media: Image Gallery and Carousel under media option. The awesome gallery allows you to zoom image, play slideshow, download media option with a full-screen display. Perhaps there is two type of carousel, one is without Captions and another is with Captions. Charts: Morris, Flotcharts, Chart.js, Sparkline, and jQuery-Knob scripts are used to produce a different type of Chats. You can remove specific scripts which you don’t need. Example Pages: Profile, Sign in, Sign up, Forgot Password, Blank Page, 404 Not Found, 500 Server Error pages are included so that you can arrange a Registration system. Typography: It expresses how the typo works inside the Template. 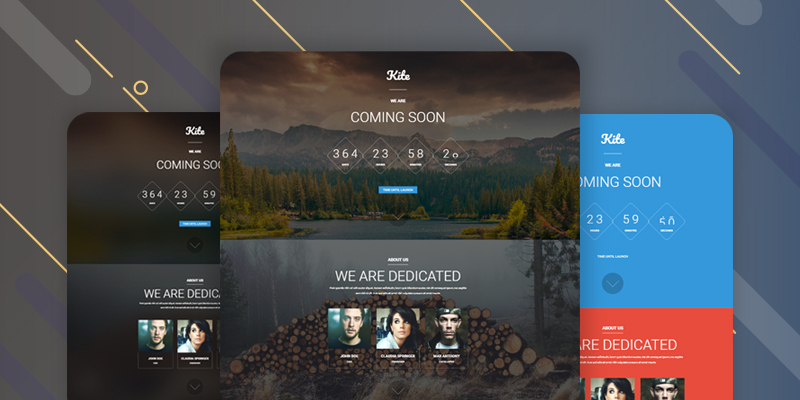 Checkout the body, Headings, Color Text, Blockquotes, List style in this page. 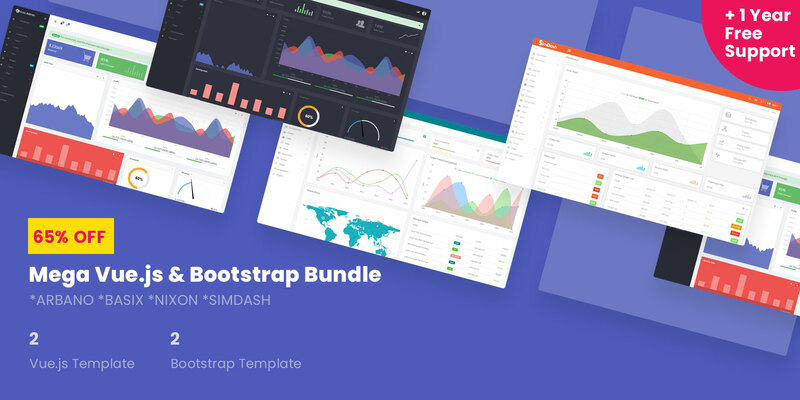 AdminBSB is a fully featured Bootstrap Dashboard Template. It comes with a lot of scripts for different section. So we recommend you to remove unnecessary scripts when you Develop a new Admin for your personal or business Use. It’s under MIT license so feel free to share and distribute it with others. It’s free doesn’t mean it has any lacking. 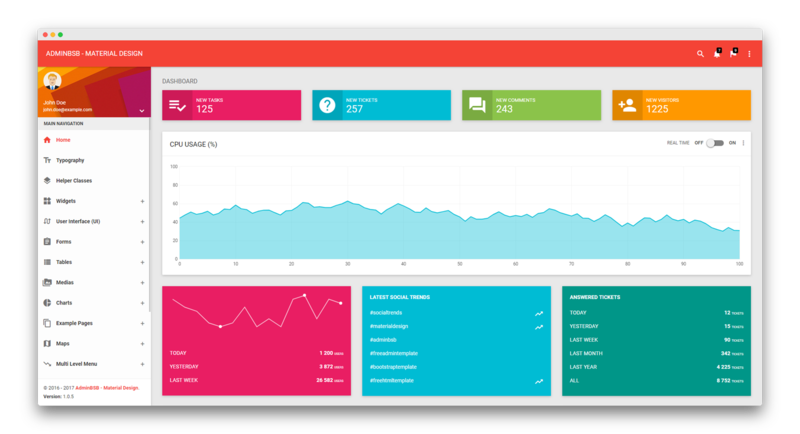 The best Dashboard Template I have ever seen.